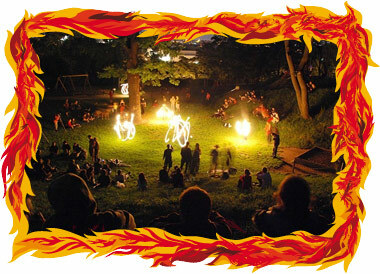 TRIBO FUEGO is free group of people with an interest focused on juggling, whirling with fire and performance. The history begun in the half of 2002, as the regular meetings aimed on juggling, as well as spinning, making masks and making stilts, meanwhile the Drummers were playing. The common work ended up with Tribo Fuego premiere on St. Nicholas day. During 2004 TF went on with a great development thanks to the experience we learnt due to many invitations to the cultural projects. The idea of a fire-performance, with all that goes along with it, had begun in the spring and the summer and has still filling up. We meet every Thursday and Wednesday for regular discussion and practise. Everybody, who wants to spin and juggle, learn something or try or just look, is invited to our meetings.